Male tennis players are almost three times more likely to be fined for losing their temper and smashing racquets than their female counterparts, The New York Times reported Saturday. The figures obtained by the Times show that men received 649 fines for breaking racquets to 99 for women in tens of thousands of matches in the four Grand Slams over the last two decades. “I have seen other men call other umpires several things. I am here fighting for women’s right and women’s equality …. and for me to say ‘thief’ and for him to take a game it made me feel like it was sexist,” she said. 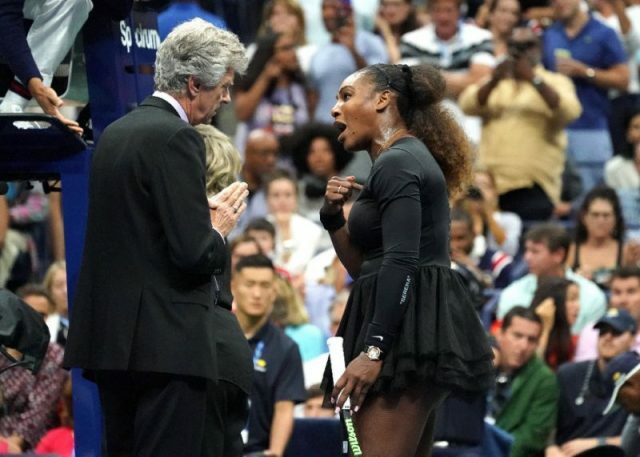 This was not the first time Williams has had a meltdown at the US Open. In 2009, Williams refused to apologize after threatening to shove a ball down a lineswoman’s throat in an expletive-laden outburst. Earlier this year at the Indian Wells tournament, Williams berated a female reporter in the players’ lounge area for asking a question at a news conference about therapeutic use exemptions.